There was a time in the not-too-distant fashion past when everything was cropped: our tops, jeans and even hair. But now influencers are aiming for Rapunzel locks instead of buzz cuts, cuffed jeans are making way for classic bootcuts and shirts are plunging below our waistlines. Whether it’s a white button-down that goes down almost to your knees or a floor-scraping top worn over pants to replicate that whole dress-over-pants vibe, the longer your top, the better. 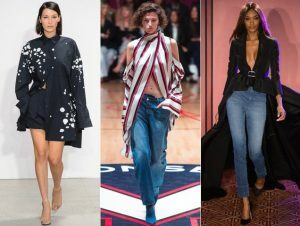 Call it a response to the deconstructed shirt trend or all those short dresses/tops with trains on the red carpet (Kendall Jenner FTW), shirts with elongated hems are growing in popularity and were trending at New York Fashion Week Spring 2018. Oscar de la Renta gave us a variety of extra long shirts, either splattered with paint-like splotches or boasting silver streaks. Monse reigned supreme when it came to offering extensions, from an off-the-shoulder red blouse that could double as a dress to a striped cold-shoulder creation that exposed skin in the front, but covered things up in the back. And Brandon Maxwell sent several waterfall-style shirts down his runway with hems so long, they rivaled any trains. The street style set already embraced longer lengths while attending the Spring 2018 shows. 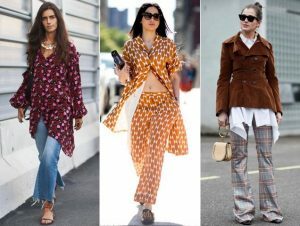 They sported winter floral blouses that went down almost to the knees of their jeans or opted for pajama co-ords with the top reaching way below the waist. And since longer lengths look great poking out the bottom of practically any winter jacket (we’re talking puffers, teddy jackets, etc. ), the Fall 2018 showgoers are also favoring shirts that they can still flaunt even when outerwear is closed tight.